Just got word that Field of Schemes: The Next Generation (ed. note: not the actual title) is now shipping from Bison Books’ website, notwithstanding the official release date being a month away. This edition has all the stadium-swindley goodness of the original FoS, plus four new chapters and annotations to the original chapters that make the whole thing clock in at a hefty 400-plus pages. 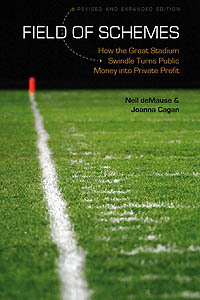 This entry was posted in Baseball, Shameless Self-Promotion, Stadiums and Arenas by Neil deMause. Bookmark the permalink.